Where is the Church? The example of St John the Chozebite. 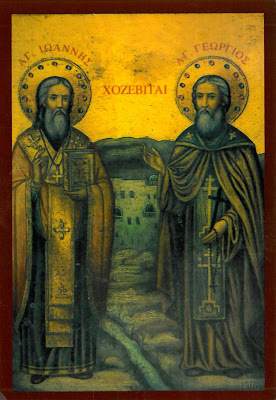 St John the Chozebite, commemorated on 3/16 October, received the holy Schema of the monks from his grandfather, who was also a monk. After bidding him farewell, John departed for Jerusalem. We are very familiar with St Mary of Egypt, and how her sinful life prevented her from entering the Holy Sepulchre specifically in order to venerate the Holy Cross. But why was St John the Chozebite prevented? He was a pious monk from his youth, from a good Orthodox family…! The life of the saint does not state specifically whether his grandfather and guide to the spiritual life also rejected the Synod of Chalcedon. But one might deduce that this was the case, since St John made no changes to his life while living at his first monastery. Neither did he find it possible to return to live there, having been enlightened by God as to the correctness of the Fourth Oecumenical Council. St John’s grandfather had led him to the spiritual life. He owed his relative every respect as an elder. Yet he did not allow their spiritual bond, nor the bond of blood to delay keep him separated from the Church of Christ. St John lived during the theological controversy regarding the Divine and human natures of Christ. It was a time of extreme troubles among Christians, precisely because of differences in doctrine. In the history of the Church, new and un-orthodox teachings emerged from a complicated background, where personal passions, antipathies, ‘politics’ and historical circumstances figured prominently. It must have been confusing indeed for the faithful to find the truth. Yet St John did not choose to ignore the problems, nor did he conclude that ‘this is for the Bishops to decide’, nor did he simply ’stay with the family’ to avoid making a decision. Today’s theological controversy deals with the nature of the Church. Some promote the strange idea that there is no necessity for Orthodox Christians to be in communion, asserting they are all ‘in the church’ if they call themselves Orthodox and have not denied any of the important tenets of the Orthodox Christian faith - even if find that in actual fact, they are separate from all other Orthodox Christian churches. This is a teaching markedly different from the traditional view of the Church. It is true that our modern time is confusing and difficult for the faithful to navigate - but the difficulties pale against the realities of life during the Christological or iconoclastic controversies. In our extremely complicated times each one of us must stop and honestly reflect whether we are in the Orthodox Church of Christ. May God enlighten those who truly seek Him to deny themselves, and bravely seek His One, Holy, Catholic and Apostolic Church!